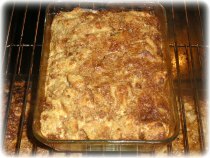 This cinnamon french toast recipe is a great Saturday morning casserole breakfast with eggs, milk, baguette and a sweet cinnamon spread. As fat as recipes for breakfast goes, this is a real tasty variation from a more traditional french toast recipe that your family can enjoy any time of the year. Even from scratch, this breakfast casserole is quick and easy to make, taking only 20-30 minutes to bake. I'm always trying to find healthy breakfast options for our family. I would like to share with you the best breakfast recipe that gives you the healthy eating option of french toast and satisfies your sweet tooth. 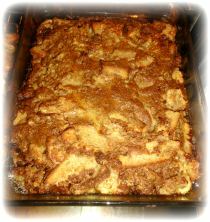 For this french toast recipe variation, I like to use a 9 x 11 and a 9 by 7 casserole dish. I will show you the steps to prepare the bread and make the 'egg' mixture and the sweet cinnamon spread. Try it on Saturday and you and your family will love it. The texture of this spread will depend on the 'creaming' you do in this step. Take extra time here to make applying the spread easier and ensuring your complete taste satisfaction. Add variety to your bread choices and mix it up a bit. We have had mixes of regular kaiser buns with rye and whole wheat buns, and even different Ciabatta bread flavors like original and walnut. Cut the breads into 3cm thick slices and arrange them into loosely fitting rows in the casserole dishes. Any extra bread can be used for snack sandwiches, garlic bread with cheese or as crumbs in making homemade burgers and meatballs. Soak each slice of bread into the 'egg' mixture from step #1 and arrange them into the casserole dishes. If you prefer to simply pour the 'egg' mixture over the bread while in the casserole dishes, make sure all the bread does get egg-soaked. Using a knife, spread the sweet cinnamon spread on both sides and the top of each slice of bread. This will get a bit messy but the end result will be wonderful on your taste buds. Cover both casserole dishes with parchment paper and place them on the middle rack of your oven at 200 degrees Celsius for 20-30 minutes (check it doesn't burn,it should be browned and the eggs cooked through). Remove from the oven and cool on wire racks for 5-10 minutes. Serve and enjoy. Careful kids it's still hot!